Isabella Blow (Isabella Delves Broughton) (1958-2007), Fashion journalist and editor. Sitter in 3 portraits. Alexander McQueen (1969-2010), Fashion designer. Sitter in 4 portraits. David LaChapelle (1963-). Artist of 1 portrait. This double portrait of Alexander McQueen and Isabella Blow was published in the March 1997 ‘Swinging London’ edition of Vanity Fair. McQueen was a fashion designer famed for his conceptually daring approach. Blow, a fashion stylist, was a great champion of McQueen, buying his graduate collection ‘Jack the Ripper Stalks His Victims’ in 1992. 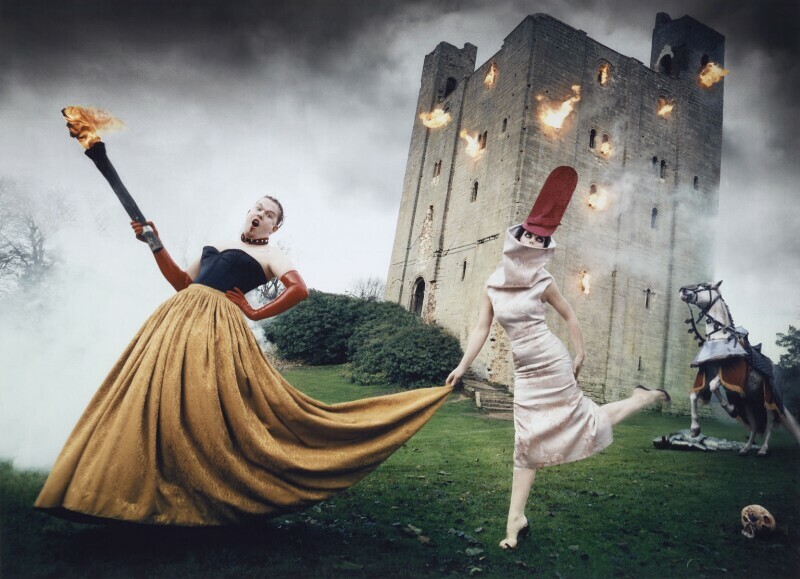 For this photograph, taken in Hedingham Castle, Essex, the pair dressed in clothes designed by McQueen, and Blow’s hat is by milliner Philip Treacy. LaChapelle subverts gender norms and notions of chivalry in this image, which also acts as a theatrical record of the sitters’ friendship. The largest ever IRA bomb is detonated in Manchester causing the destruction of many buildings and over 200 injuries. Nobody died in the incident because a warning was given and the area evacuated. After the bombing much of Manchester was rebuild and in 1998 it won a successful bid to host the 2002 Commonwealth Games. Prince Charles and Princess Diana finalise their divorce after four years of separation. The Spice Girls enjoy massive popular success with their first single Wannabe going straight to Number 1. The group are remembered as much for their sassy, outspoken 'girl power' attitude and their continuing subsequent celebrity as for their music. Danny Boyle tells the story of a group of Edinburgh heroin addicts in his critically acclaimed film version of Irvine Welsh's novel Trainspotting. The First Chechnya War breaks out between Chechnya and Russia when Russian forces invade the country in support of Chechnyan opposition to the government. The invasion went badly with strong Chechnyan resistance and dissent in the Russian command. However, a truce was finally established after Russia seized the capital Grozny. More than 46,000 people died as a result of the conflict.